This new astronomical time-lapse video features the unique SAMI (Sydney-AAO Multi-object Integral-field unit) instrument at the Anglo-Australian Telescope and the beauty of the dark sky over Siding Spring Observatory. 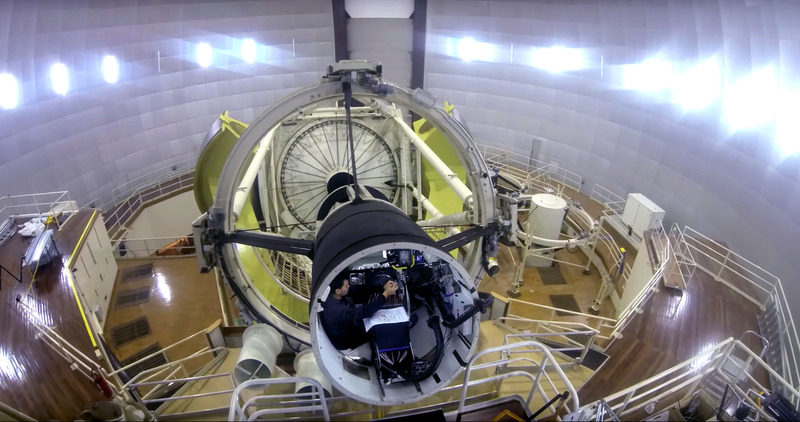 One of the most powerful instruments at the Anglo-Australian Telescope (Siding Spring Observatory, NSW) is the Sydney-AAO Multi-object Integral-field unit (SAMI). SAMI provides 13 fibred based IFUs called "hexabundles" that can "dissect" astronomical objects using spectroscopy. This instrument is used by the SAMI Galaxy Survey (link is external), that aims to "dissect" 3000 galaxies in different environments to help astronomers understand galaxy evolution and the tight relationship between gas and stars in galaxies. However, unlike what the 2dF robot does, SAMI hexabundles must be plugged and unplugged manually very carefully by an expert user. This video tells the story of a typical observing night with SAMI at the Anglo-Australian Telescope. In the first part, observers carefully prepare the SAMI instrument unplugging the plate they observed the previous night and plugging a complete new plate to be observed that night. SAMI observers usually need half an hour to complete this task, but in this timelapse video it is done in just a minute. Later they move to the AAT Control Room and start observations just as the sun sets. The twilight moves to a moonless, dark night, when only the stars shine over the Anglo-Australian Telescope, providing an spectacular view of the night sky from the Southern Hemisphere, and clear skies for the SAMI Galaxy Survey team to dissect distant galaxies. In this timelapse you will see the Milky Way rising and setting, the Southern Cross with the Coalsack, the globular cluster 47 Tucanae near the Small Magellanic Cloud, the Large Magellanic Cloud with its strong star-forming region the Tarantula Nebula (30 Doradus), star clusters like the Pleiades moving behind the AAT, Orion rising and setting, the Carina Nebula rising, the magestic Emu in the Sky, and circumpolar stars (with the International Space Station) turning above the dome of the Anglo-Australian Telescope. All the sequences have been filmed and processed in high resolution (4K) by astronomer Ángel R. López-Sánchez (Australian Astronomical Observatory / Macquarie University) while observing at the AAT for the SAMI Galaxy Survey (link is external), between September 2015 and March 2017. He used a CANON 5D Mark III with different lenses, all at f2.8. The night sequences typically have 24 frames per second, each frame lasting 30 seconds in real time. Therefore 1 second of the night sequences corresponds to 12 minutes in real time. To enjoy this video, watch it in full screen and at least in Full-HD (4K resolution recommended), in a dark room. As in real life, the details in the sky appear when we are far from the light pollution. It’s personal (World in flames, 2011), Celestial Aeon Project. The SAMI instrument was a collaborative development between the University of Sydney and the Australian Astronomical Observatory. The SAMI Galaxy Survey is supported by, and a key project of, the ARC Centre of Excellence for All Sky Astrophysics (CAASTRO). Site design, construction and maintenance by Andy Green.